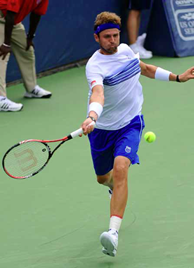 "Washington is a great tournament - it has always been one of my favorite stops on the tour," says two-time quaterfinalist Mardy Fish." I'm hoping to be the first champion of the new Citi Open." Two of America’s top tennis stars will headline the Citi Open, where watching tennis in the nation’s capital is a unique experience. Mardy Fish and Sam Querrey each hope to be the first American to win the event since Andy Roddick in 2007. Fish, who helped the U.S. defeat Switzerland in Davis Cup action this year, is a two-time quarterfinalist in Washington, D.C., while Querrey will make his fourth career tournament appearance. The international field includes Germany’s Tommy Haas, South African Kevin Anderson and Mikhail Youzhny of Russia. The 34-year-old Haas, a semifinalist here in 2008, won the ATP World Tour event last month on grass in Halle, Germany, stunning Roger Federer in the final. Anderson broke into the Top 30 for the first time earlier this year, while Youzhny has eight career singles titles and earlier this month reached the Wimbledon quarterfinals. Arthur Ashe passed away in 1993, but his influence can still be felt. In the late 1960s, he suggested a naturally integrated neighborhood for a new tennis event in Washington, D.C. The site selected was Rock Creek Park, current home of the Citi Open. Alexandr Dolgopolov, the 23-year-old Ukrainian who has been ranked as high as No. 13 in the world. With an entertaining playing style, the crafty pro will thrill fans at the Citi Open this summer as he makes his Washington, D.C. debut. The Citi Open is owned by the Washington Tennis & Education Foundation, which was founded in 1955 to help underprivileged children through academics and tennis. The Foundation was named the 2010 National Community Tennis Association of the year by the USTA.